Vitamin B-3 500mg is a highly dosed and vegan dietary supplement free from anti-caking agents. Vitamin B3, also known as niacin, occurs naturally in fish, meat, offal, peanuts, whole grains and ground coffee. It is particularly important for plenty of metabolic processes and the body uses it to form special fatty acids. The body is also able to transform the two main compounds nicotinamide and nicotinic acid into one another, but an additional vitamin B3 supply through dietary supplements is quite useful. Do you meet your daily vitamin B3 requirement? Usually, we take in a large portion of the daily vitamin B3 requirement through foods, for example some kinds of meat or fish. It is possible, though, that the body develops deficiency signs when the vitamin B3 supply is insufficient. If your food doesn´t provide you with enough vitamin B3, the intake of dietary supplements can be beneficial, because it supports the body to keep its natural appetite and promotes the general fitness and energy. It is also important to mention that the body needs vitamin B3 to generate energy from carbohydrates, protein and some fats. The brain uses the nutrient to regularly form new messengers and it helps to form nerve cells. 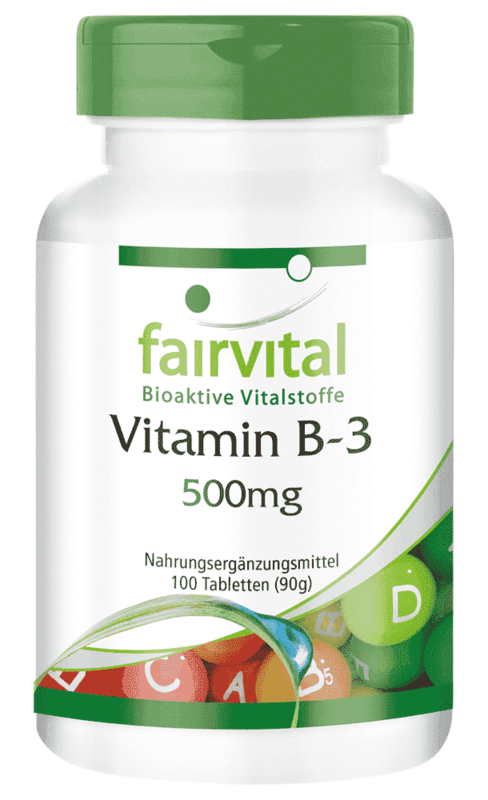 Furthermore, a vitamin B3 supplement is able to promote healthy mucous membranes and skin as well as protect the nervous system and many psychological functions.